Today’s telemetry test flight (now designated as Horus 51) was performed with (mostly) good results! This launch was an experiment to investigate solutions to the ‘Horus Binary’ payload PLL-loss-of-lock issue that has been observed on previous launches. 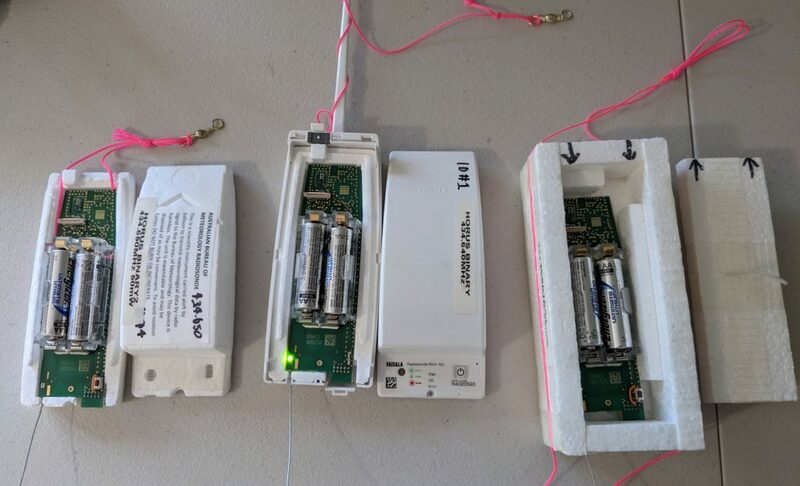 Three payloads were launched, with variations on insulation and transmit power, all using reprogrammed Vaisala RS41 radiosonde PCBs. As a result, there was a lot of telemetry to receive on this flight! The launch was a fairly relaxed affair, with only a small launch crew on-site. Launch occurred right on time at 11AM. It was quickly discovered that a bit too much helium was used (dodgy gas flow-rate meter! ), and so the ascent rate was higher than expected resulting in the small balloon used bursting at 16.2km altitude. 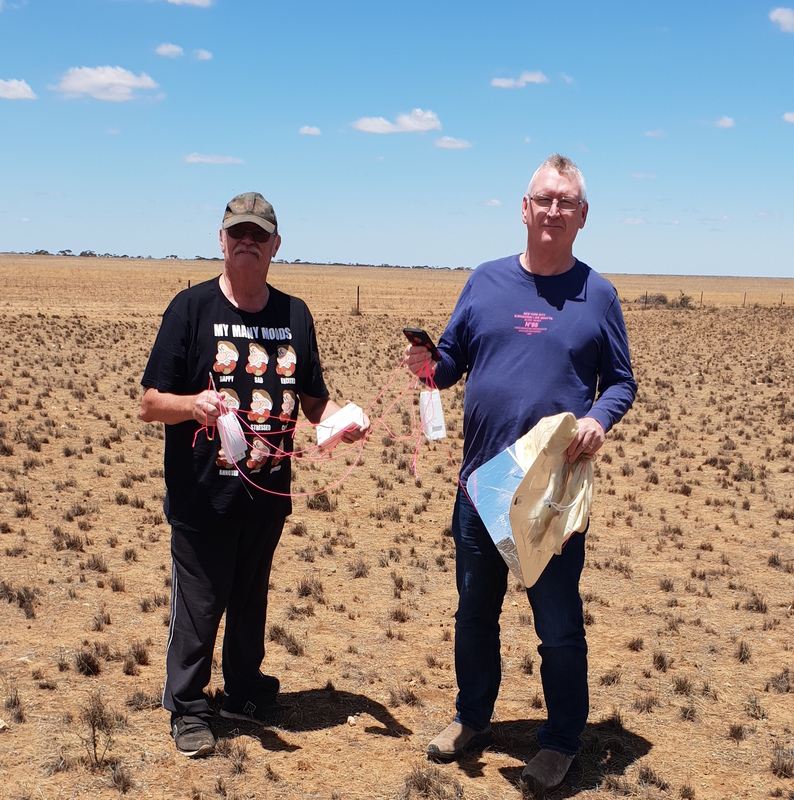 As the pre-launch flight path prediction had the landing area somewhere south-west of Loxton, none of the launch crew attempted to chase this launch. 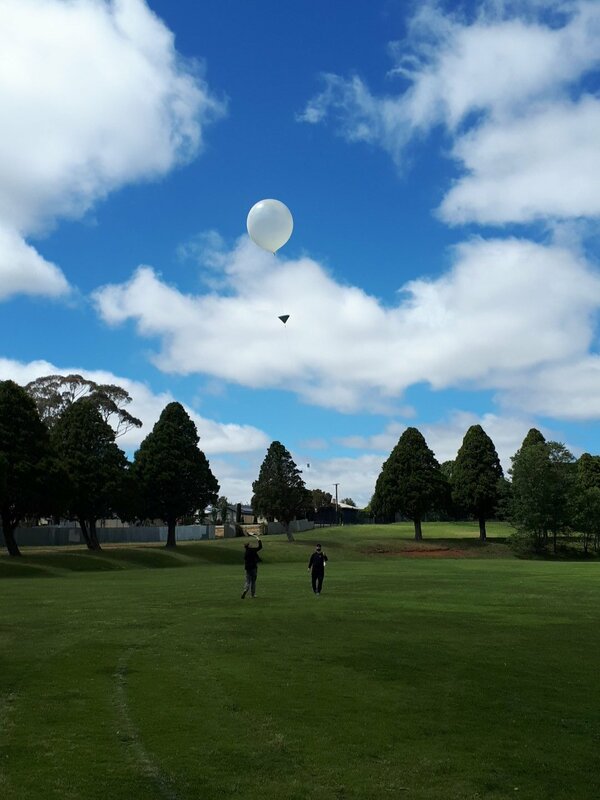 Instead, Ivan (VK5HS) from the Riverland Radio Club lead a small team (Ivan, David and Peter) out from Renmark to recover the payload. As it turns out, the higher ascent rate and lower burst altitude resulted in the landing location being further away from Loxton than expected, but the Riverland boys were able to track payloads down to the ground and easily recover them not long after landing. David (left) and Peter (right) with the recovered payloads. Many thanks to Ivan & Co for making the effort to get out and chase, it is much appreciated! Please make sure you follow the configuration instructions when using the Horus Binary decoder, to avoid the ‘YOUR_CALL_HERE’ entries seen in the above tables! Previous Horus launches have seen the repurposed Vaisala RS41 payloads lose PLL-lock mid-flight, with the transmit frequency drifting up the 70cm band as temperature decreases. Testing on the ground indicated this may be due to the Radio IC (a Silicon Laboratories Si4032 FSK transmitter) failing with the low temperatures experienced during flight. The fact that the the RS41 sondes do not usually fail during their intended application pointed at the lower transmit power (25mW vs 50mW) used on Horus flights being a possible factor. Horus 49 (Anstey 2.0) – RS41 Foam Only, 25mW – No issues Encountered. Telemetry Test Flight #1 – RS41 Foam Only, 25mw – Failed on Ascent at 9km altitude, recovered on descent at 1km altitude. Horus 50 – Stock RS41, 25mW – Failed on descent for ~6 minutes between 13km and 9km altitude. With 2 failures and one success, it was decided that more data needed to be gathered. On this launch, two payloads were operated at 50mW transmit power, one with a ‘stock’ enclosure (‘HORUSBINARY’) and one with only the inner foam insulation (‘HORUSBINARY2’). Using only the inner foam insulation provides a significant weight reduction, cutting the payload weight almost in half (~120g to ~60g). A third payload (‘4FSKTEST’), using a custom-built foam enclosure was also tested, transmitting at 25mW. This had a similar overall weight (66g) to the foam-only RS41 enclosure, and re-flew the RS41 board that failed on Horus 50. A bug in the firmware, discovered after the Horus 50 flight, was also fixed for this launch. This fix allowed gathering of measurements from a temperature sensor on the silicon die of the radio transmitter IC – unfortunately the temperature measurements captured on previous launches are invalidated as a result of this bug. Sadly, the foam-only payload (‘HORUSBINARY2’) was observed to fail at 14.3km altitude during ascent, and recover at 4.8km on descent, failing with a radio IC temperature of 0 ˚C. Both the stock RS41 and custom enclosure payload remained operational throughout the flight. 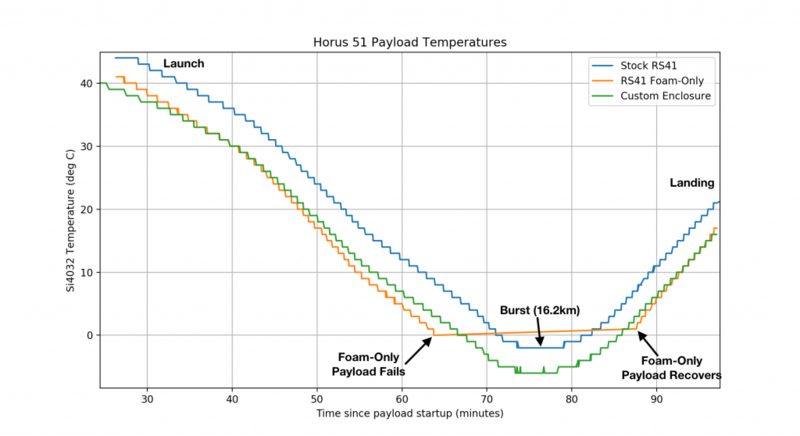 The overall higher temperatures reported by the Stock RS41 payload may be a result of a bias in the temperature sensor, or may be a result of the better insulation – Further investigation will be performed once the payloads make their way back to Adelaide. Curiously, the two other payloads reported radio IC temperatures lower than the failure point of the foam-only payload (0˚C), indicating that perhaps it is not the radio IC at fault, but another component on the PCB. Further investigation will be performed on RS41 PCBs using selective cooling of components, prior to the next Horus launch sometime in January 2019. 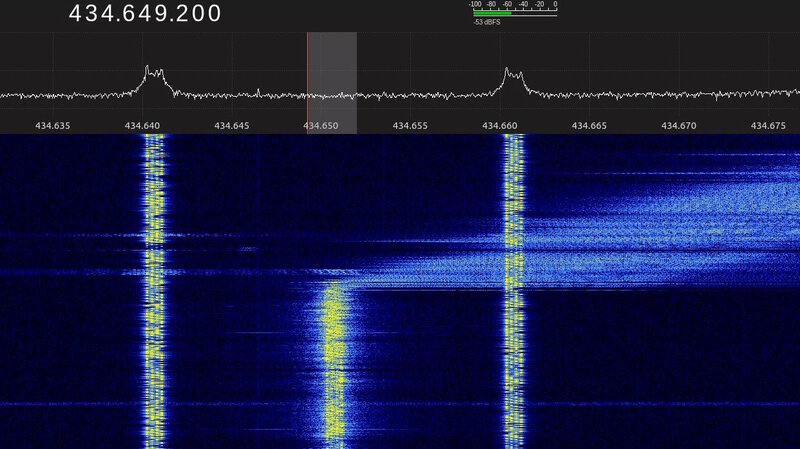 However, based on the results from this flight, it appears that the safest option for the moment is the Stock RS41 enclosure, transmitting at 50mW. 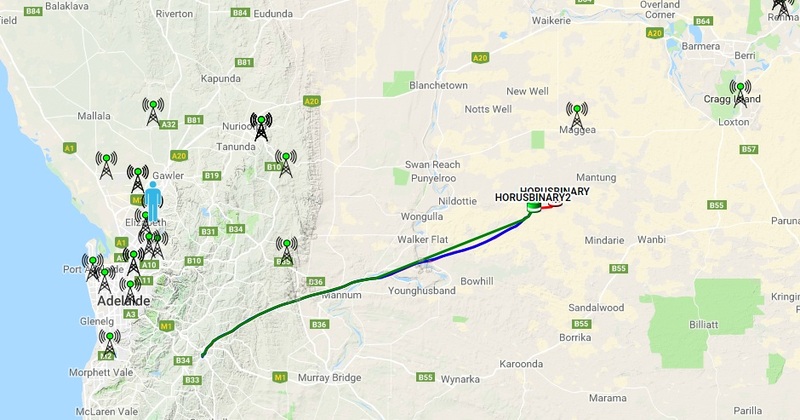 As always, Horus flights use redundant telemetry transmitters, so that a failure of a single transmitter does not compromise our ability to track and recover! This entry was posted in Project Horus by VK5QI. Bookmark the permalink.